It's that time of the year again when the Golf Digest Ireland Top 100 Courses listing comes out and this time around I've gotten so many mails and comments from angry industry folk asking me to air their frustrations I couldn't avoid it. Despite desperately trying to! First of all let me say this at the outset. 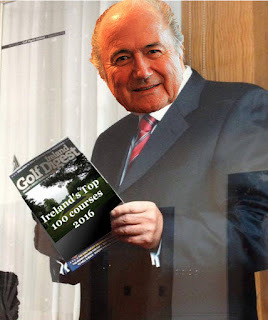 I personally lost interest in the Golf Digest Ireland Top 100 ranking list a long time ago. I think it's fundamentally wrong that one publication should have such a huge influence. For me it would be better that there be no list at all than all this bitching and bickering and politics about a new one every year. If there is to be a list I have a whole raft of great ideas to make it far better, but nobody cares what I say! I know some of the people on the panel and hold them in the highest regard but this post consists of the emails and messages of several interested parties, who haven't a voice, but are upset at how money spend with the publishers is affecting the final list. I just collated the anger and added the funny bits. Since publication of the list, the running joke in the Irish golf industry is that Walton Media, the company behind Golf Digest Ireland are the new FIFA of golf! Their elevation of Moyvalley Golf Club into the top 100 courses on the island, just months after taking over the PR and marketing for the club, has angered just about everybody; except probably the folks from Moyvalley. And allegations that position on the list is heavily influenced by advertizing spend with the company are rife. I don't spend money with them, and we feel out in the cold with regards to this list as a result. The most representative email I got however was from a course manager in the East, who has been calling and waving across the proverbial street at Golf Digest for ages, but still cannot even get them to glance in his general direction. I have been trying to get in contact since 2015 with no response from Golf Digest - (doesn't surprise me). Money talks.. I feel the list in unfair, it is not a fair portrayal of Irish golf courses (for those based at home in Ireland and those visiting golfers from abroad). The top 100 golf courses.. that is meant to be the new list.. and I feel the criteria and those involved in the decision making let themselves down very much. You will see Galway Bay moving 10 places from 79 in 2015 to No. 69 in 2016.. wow and I called it in October 2015. Why may you ask? They did a lot of promotion / events in 2015 and spent a lot of money with Walton Media! Now I haven't played Galway Bay in 15 years so haven't a clue how good it is, but Irish golf course expert Kevin Markham (who has played every single one of them) knows his onions and explains in his Hooked On Golf Blog why Galway suddenly jumped up so high and another reason why Moyvalley is there. Kevin also points out that it's a bit wonky that Doonbeg moved up four places this year despite kindof being more or less closed for the year! Dooks and Doonbeg have swapped completely. Dooks is down 4. Doonbeg is up 4. Dooks' greens are among the best in the country and the course has been given some nice professional touches following their 125th anniversary. Doonbeg, on the other hand, is being upgraded and these upgrades are not yet complete. How can it go up? So it's all a bit of a mess but packaged and branded under the iconic Golf Digest banner, the fact is that this top 100 list is going to heavily influence tourism traffic to the courses. Several of the industry people that contacted me pointed out the fact that the main panellists haven't actually played the courses they are rating this year and found it 'dodgy at best' that every resort that has ever hosted the two day ranking panel meeting have always jumped up the rankings. Oh dear oh dear oh dear. Sepp Blatter is free and looking for work if anyone is interested!